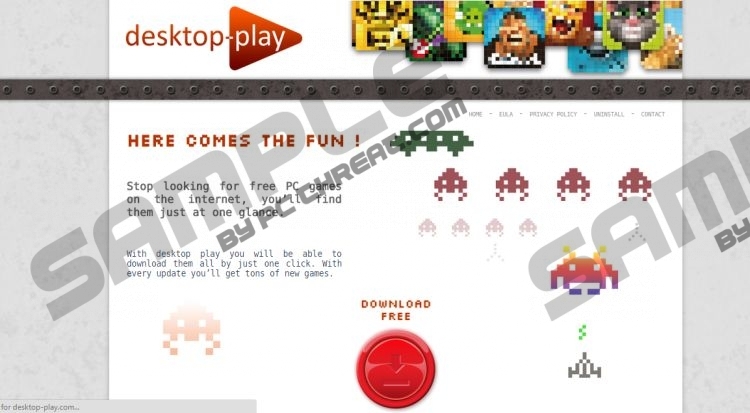 Desktop-play is an adware-type application that does not look malicious at first glance. However, we recommend that you remove it, because it might display unreliable commercial advertisements. In any case the application is rather useless, because you can download the applications that Desktop-play promotes from other legitimate sources without any difficulty. So there is no reason to keep this program especially since its pop-up window will sooner or later start to annoy you. In addition to that, research has shown that some of the games contain malicious files were probably added by the developers of Desktop-play. Therefore, we recommend that you delete this infection ASAP. The application can be downloaded from the website, called Desktop-play.com. The application is digitally signed by Tuto4PCcom, but it cannot be found on the website. Our research has shown that the application is similar to older apps, such as GamesDesktop, OneSoftPerDay, MyBestOffersToday, and some others. Of course, we also recommend that you delete the aforementioned infections as well if it happens that you encounter them. The program is presented as a useful application that will provide you with all kinds of fun by offering you to game downloads from the convenience of your desktop. Its website states that the application will be updated regularly to include new games. At the time of this article, the application featured Half-life 2 Garry’s mod, which is likely been modified, since it does not feature information about its developer. The deceiving part is that the game cannot even run without Steam and a legitimate version of Half-life 2, so you will have to remove it. And we are of the opinion that there is no point of featuring this game in the first place. Another popular game featured on the application is Plants vs. Zombies developed by PopCap Games. But this version of the game is not in English so it’s hardly appealing to the international audience, which is being targeted in this case. The third game is 123 Free Solitare published by TreeCardGames and the forth is Warcraft III: Frozen Throne and the fifth is Pure Sudoku. The latter two games do not indicate their developer, so it is likely that they have been tampered as well. All of the games are downloaded from cdn.clouds4ads.com, which is an unreliable server, because it might also download additional payload featuring malicious apps. We recommend that you remove Desktop-play, because the reliability of its featured software cannot be verified. We have tested the installations with SpyHunter, which showed warning that the Garrie’s mod and Pure Sudoku contain infections. Therefore, we recommend that you remove Desktop-play and get a malware scanner that will remove the remaining malicious files. Click Settings and select Control Panel and open Programs and Features. Locate Desktop-play and right-click on it and click Uninstall. Open the Start menu and click Control Panel and select Uninstall a program. Locate Desktop-play and right-click on it, and click Uninstall. Locate Desktop-play and click Uninstall. Quick & tested solution for Desktop-play removal.